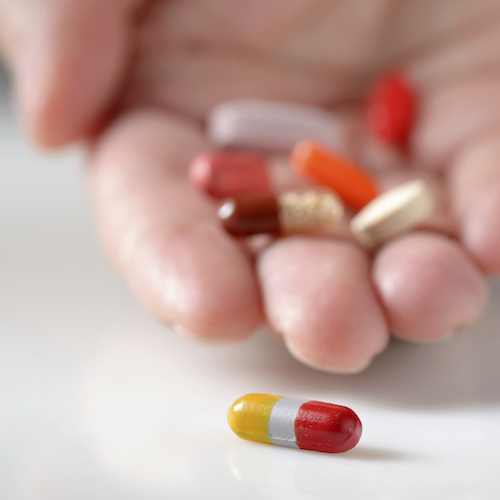 When you start to think about how many calories you consume eating Halloween candy and other sweet treats, you may find that the holiday is even scarier than you suspected. Halloween treats aren’t always healthy, but there are some easy ways to turn more wholesome ingredients into spooky treats that won’t weigh you down. Spinach fettuccine creates ghoulish green strands that will serve as a bed for a heaping scoop of marinara sauce, which you can top with slices of mozzarella cheese—a cheese stick works great—topped with a slice of black olive. 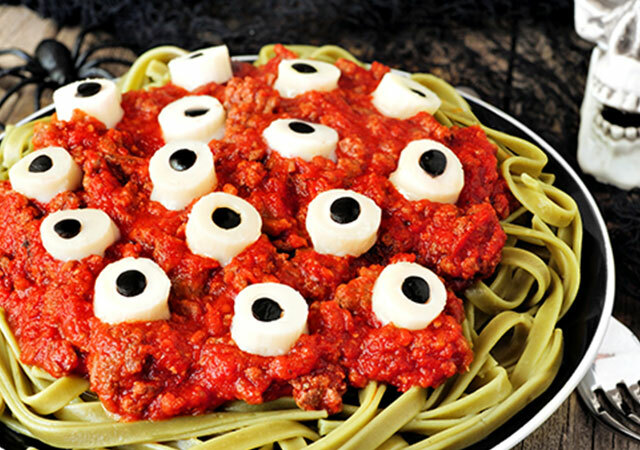 These details pop like eyeballs for a dinner that will look right back at you! 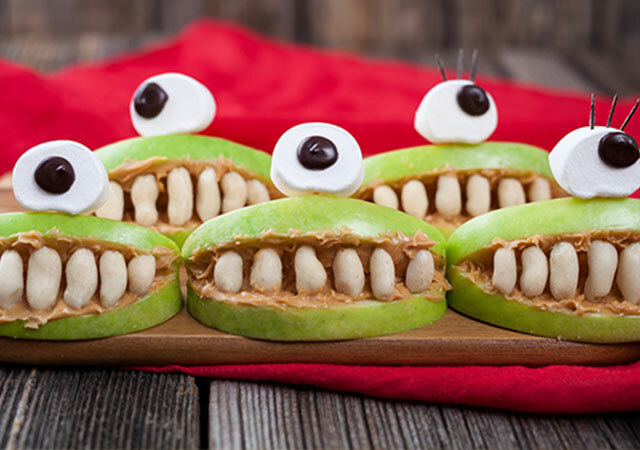 These scary cyclops are easy to put together with some apple slices, peanut butter, cashews for teeth, and marshmallows with a chocolate candy center for the eyes. 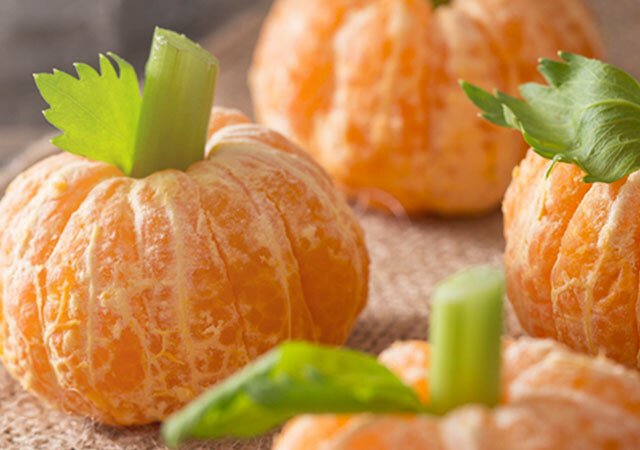 A sweet and simple snack that will round out any party table or kids’ Halloween lunch are these adorable peeled tangerines with a celery stem that looks just like a pumpkin. 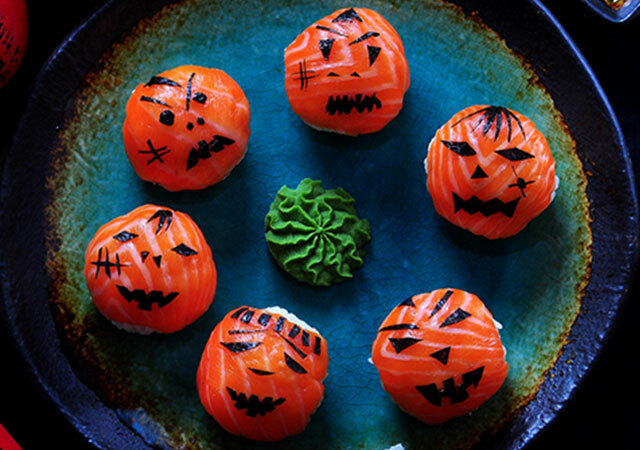 You will need to look for sushi-grade salmon to put these Jack-O-Lanterns together, which use balls of sticky rice to hold their shape. Cut pieces of nori—or thin sheets of seasoned seaweed—create the face and head details that can be custom designed for each piece of fish. 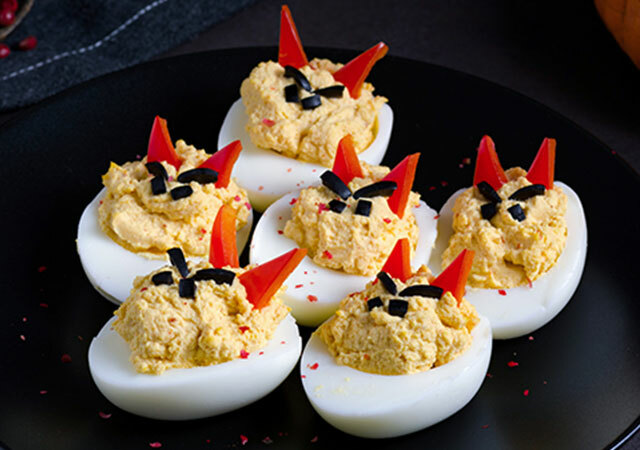 Red pepper triangles and sliced black olives create the evil eyes and horns for these creatively crafted deviled eggs, which are a classic party food to serve on your Halloween spread. 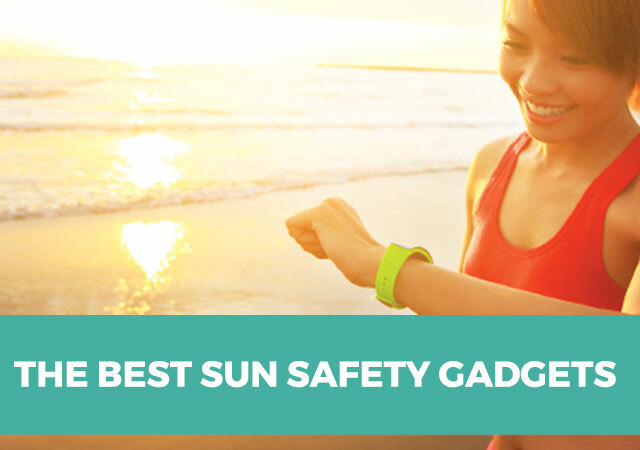 Keep your devils on the healthier side by only using two-thirds of the yolks when preparing and substitute nonfat cottage cheese for the other one-third to keep the filling just as velvety and rich. It’s not Halloween without something sweet, but you can use fruit to add some substance to your sugary treats. 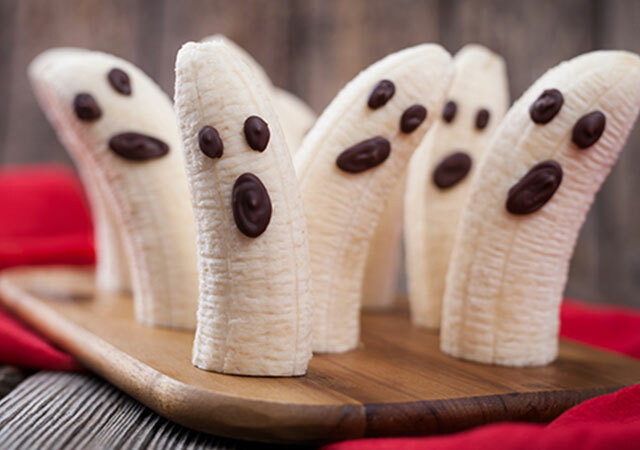 Cut and peeled bananas look ghostly and ghoulish with faces drawn on using melted chocolate that’s chilled on the surface of the bananas. 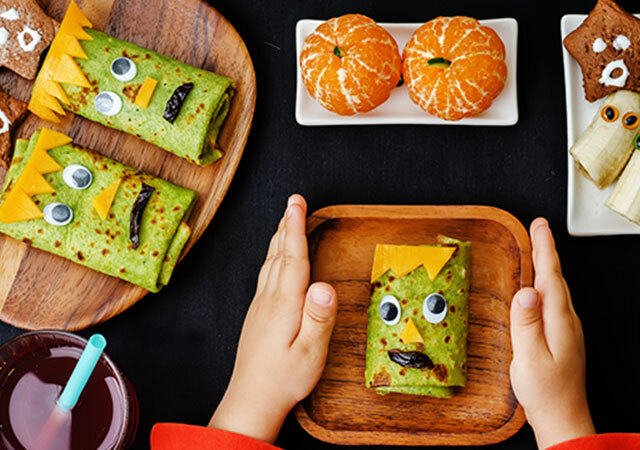 Bring Frankenstein’s monster to life with spinach tortilla wraps that use cut slices of cheese, googly eyes, and sundried tomatoes to make faces on the outside of the burrito, which can be filled with any of your favorite meats, cheeses, and veggies. 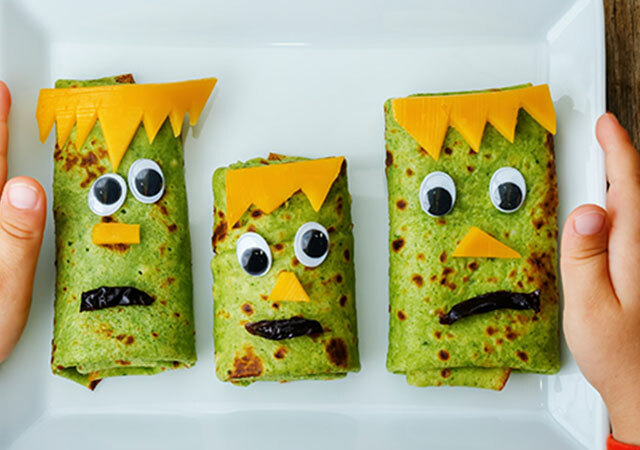 Looking for a fun dinner to serve before trick-or-treating? 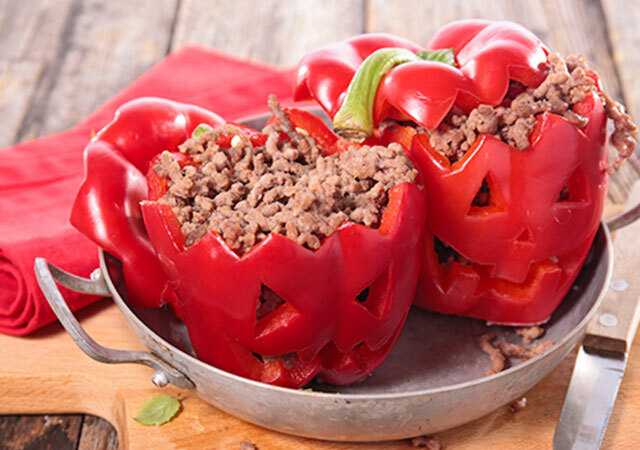 Try your hand at making these stuffed bell peppers, which look like Jack-O-Lanterns when you cut out details for the face before filling with ground turkey and brown rice. 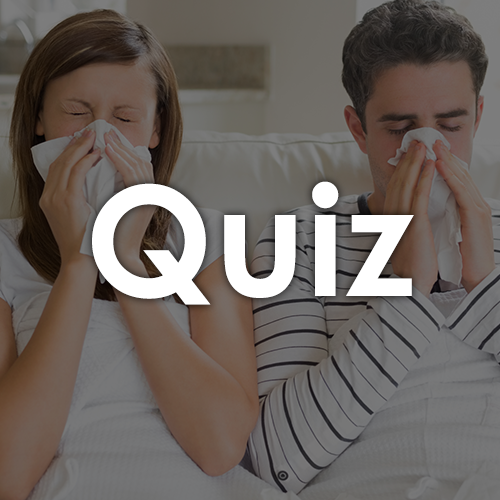 When you need a little extra boost for your health or some quick tips to get you through the holiday season, you can rely on MeMD for fast medical care from the comfort of your own home.